This article is about the stone monuments. For other uses, see Stele (disambiguation). "Stela" redirects here. For the satellite bill called STELA, see Satellite Television Extension and Localism Act of 2010. For the name, see Stela (name). "Stelae" redirects here. For the town of ancient Crete, see Stelae (Crete). "Stelai" redirects here. For the battle, see Battle of Stelai. "Stone tablet" redirects here. For the Ten Commandments stone tablet, see Tablets of Stone. 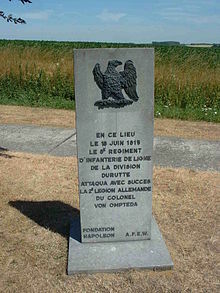 Stele to the French 8th Infantry Regiment. One of more than half a dozen steles located on the Waterloo battlefield. A stele (/ˈstiːli/ STEE-lee)[Note 1], or occasionally stela (plural stelas or stelæ), when derived from Latin, is a stone or wooden slab, generally taller than it is wide, erected in the ancient world as a monument. Grave stelae were often used for funerary or commemorative purposes. Stelae as slabs of stone would also be used as ancient Greek and Roman government notices or as boundary markers to mark borders or property lines. The surface of the stele usually has text, ornamentation, or both. The ornamentation may be inscribed, carved in relief, or painted. Steles are occasionally erected as memorials to battles. For example, along with other memorials, there are more than half-a-dozen steles erected on the battlefield of Waterloo at the locations of notable actions by participants in battle. Traditional Western gravestones may technically be considered the modern equivalent of ancient stelae, though the term is very rarely applied in this way. Equally, stele-like forms in non-Western cultures may be called by other terms, and the words "stele" and "stelae" are most consistently applied in archaeological contexts to objects from Europe, the ancient Near East and Egypt, China, and sometimes Pre-Columbian America. Steles have also been used to publish laws and decrees, to record a ruler's exploits and honors, to mark sacred territories or mortgaged properties, as territorial markers, as the boundary steles of Akhenaton at Amarna, or to commemorate military victories. They were widely used in the ancient Near East, Mesopotamia, Greece, Egypt, Somalia, Eritrea, Ethiopia, and, most likely independently, in China and elsewhere in the Far East, and, independently, by Mesoamerican civilisations, notably the Olmec and Maya. The large number of steles, including inscriptions, surviving from ancient Egypt and in Central America constitute one of the largest and most significant sources of information on those civilisations, in particular Maya stelae. The most famous example of an inscribed stela leading to increased understanding is the Rosetta Stone, which led to the breakthrough allowing Egyptian hieroglyphs to be read. An informative stele of Tiglath-Pileser III is preserved in the British Museum. Two steles built into the walls of a church are major documents relating to the Etruscan language. Standing stones (menhirs), set up without inscriptions from Libya in North Africa to Scotland, were monuments of pre-literate Megalithic cultures in the Late Stone Age. The Pictish stones of Scotland, often intricately carved, date from between the 6th and 9th centuries. An obelisk is a specialized kind of stele. The Insular high crosses of Ireland and Britain are specialized steles. 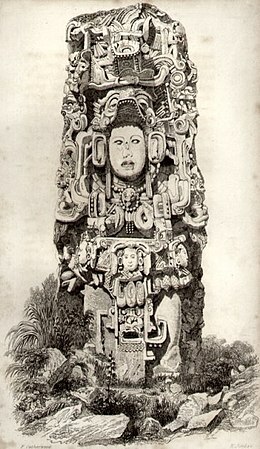 Totem poles of North and South America that are made out of stone may also be considered a specialized type of stele. Gravestones, typically with inscribed name and often with inscribed epitaph, are among the most common types of stele seen in Western culture. Most recently, in the Memorial to the Murdered Jews of Europe in Berlin, the architect Peter Eisenman created a field of some 2,700 blank steles. The memorial is meant to be read not only as the field, but also as an erasure of data that refer to memory of the Holocaust. Many steles have been used since the First Dynasty of Egypt. These vertical slabs of stone depict tombstones, religious usage, and boundaries. Urartian steles were freestanding stone obelisks that served a variety of purposes, sometimes they were located within temple complexes, or set within monumental rock-cut niches (such as the niche of the Rock of Van, discovered by Marr and Orbeli in 1916) or erected beside tombs. Others stood in isolated positions and, such as the Kelashin Stele, had a commemorative function or served as boundary markers. Although sometimes plain, most bore a cuneiform inscription that would detail the stele's function or the reasons for its erection. The steel from Van's "western niche" contained annals of the reign of Sarduri II, with events detailed yearly and with each year separated by the phrase "For the God Haldi I accomplished these deeds". Urartian steles are sometimes found reused as Christian Armenian gravestones or as spolia in Armenian churches - Maranci suggests this reuse was a deliberate desire to capitalize on the potency of the past. Some scholars have suggested Urartian steles may have influenced the development of the Armenian khachkar. Chinese ink rubbings of the 1489 (left) and 1512 (right) steles left by the Kaifeng Jews. Steles (Chinese: bēi 碑) have been the major medium of stone inscription in China since the Tang dynasty. Chinese steles are generally rectangular stone tablets upon which Chinese characters are carved intaglio with a funerary, commemorative, or edifying text. They can commemorate talented writers and officials, inscribe poems, portraits, or maps, and frequently contain the calligraphy of famous historical figures. In additional to their commemorative value, many Chinese steles are regarded as exemplars of traditional Chinese calligraphic scripts, especially the clerical script. Chinese steles from before the Tang dynasty are rare: there are a handful from before the Qin dynasty, roughly a dozen from the Western Han, 160 from the Eastern Han, and several hundred from the Wei, Jin, Northern and Southern, and Sui dynasties. During the Han dynasty, tomb inscriptions (墓誌, mùzhì) containing biographical information on deceased people began to be written on stone tablets rather than wooden ones. Erecting steles at tombs or temples eventually became a widespread social and religious phenomenon. Emperors found it necessary to promulgate laws, regulating the use of funerary steles by the population. The Ming dynasty laws, instituted in the 14th century by its founder the Hongwu Emperor, listed a number of stele types available as status symbols to various ranks of the nobility and officialdom: the top noblemen and mandarins were eligible for steles installed on top of a stone tortoise and crowned with hornless dragons, while the lower-level officials had to be satisfied with steles with plain rounded tops, standing on simple rectangular pedestals. Steles are found at nearly every significant mountain and historical site in China. The First Emperor made five tours of his domain in the 3rd century BC and had Li Si make seven stone inscriptions commemorating and praising his work, of which fragments of two survive. One of the most famous mountain steles is the 13 m (43 ft) high stele at Mount Tai with the personal calligraphy of Emperor Xuanzong of Tang commemorating his imperial sacrifices there in 725. A number of such stone monuments have preserved the origin and history of China's minority religious communities. The 8th-century Christians of Xi'an left behind the Nestorian Stele, which survived adverse events of the later history by being buried underground for several centuries. Steles created by the Kaifeng Jews in 1489, 1512, and 1663, have survived the repeated flooding of the Yellow River that destroyed their synagogue several times, to tell us something about their world. China's Muslim have a number of steles of considerable antiquity as well, often containing both Chinese and Arabic text. Thousands of steles, surplus to the original requirements, and no longer associated with the person they were erected for or to, have been assembled in Xi'an's Stele Forest Museum, which is a popular tourist attraction. Elsewhere, many unwanted steles can also be found in selected places in Beijing, such as Dong Yue Miao, the Five Pagoda Temple, and the Bell Tower, again assembled to attract tourists and also as a means of solving the problem faced by local authorities of what to do with them. The long, wordy, and detailed inscriptions on these steles are almost impossible to read for most are lightly engraved on white marble in characters only an inch or so in size, thus being difficult to see since the slabs are often 3m or more tall. There are more than 100,000 surviving stone inscriptions in China. However, only approximately 30,000 have been transcribed or had rubbings made, and fewer than those 30,000 have been formally studied. Stela 51 from Calakmul, dating to 731, is the best preserved monument from the city. It depicts the king Yuknoom Took' K'awiil. Maya stelae were fashioned by the Maya civilization of ancient Mesoamerica. 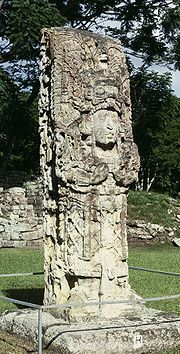 They consist of tall sculpted stone shafts or slabs and are often associated with low circular stones referred to as altars, although their actual function is uncertain. Many stelae were sculpted in low relief, although plain monuments are found throughout the Maya region. The sculpting of these monuments spread throughout the Maya area during the Classic Period (250–900 AD), and these pairings of sculpted stelae and circular altars are considered a hallmark of Classic Maya civilization. The earliest dated stela to have been found in situ in the Maya lowlands was recovered from the great city of Tikal in Guatemala. During the Classic Period almost every Maya kingdom in the southern lowlands raised stelae in its ceremonial centre. Stelae became closely associated with the concept of divine kingship and declined at the same time as this institution. The production of stelae by the Maya had its origin around 400 BC and continued through to the end of the Classic Period, around 900, although some monuments were reused in the Postclassic (c. 900–1521). The major city of Calakmul in Mexico raised the greatest number of stelae known from any Maya city, at least 166, although they are very poorly preserved. Hundreds of stelae have been recorded in the Maya region, displaying a wide stylistic variation. Many are upright slabs of limestone sculpted on one or more faces, with available surfaces sculpted with figures carved in relief and with hieroglyphic text. Stelae in a few sites display a much more three-dimensional appearance where locally available stone permits, such as at Copán and Toniná. Plain stelae do not appear to have been painted nor overlaid with stucco decoration, but most Maya stelae were probably brightly painted in red, yellow, black, blue and other colours. Ogham stones are vertical grave and boundary markers, erected at hundreds of sites in Ireland throughout the first millennium AD, bearing inscriptions in the Primitive Irish language. They have been occasionally been described as "steles." The Horn of Africa contains many stelae. In the highlands of Ethiopia and Eritrea, the Axumites erected a number of large stelae, which served a religious purpose in pre-Christian times. One of these granite columns is the largest such structure in the world, standing at 90 feet. Additionally, Tiya is one of nine megalithic pillar sites in the central Gurage Zone of Ethiopia. As of 1997, 118 stele were reported in the area. Along with the stelae in the Hadiya Zone, the structures are identified by local residents as Yegragn Dingay or "Gran's stone", in reference to Imam Ahmad ibn Ibrahim al-Ghazi (Ahmad "Gurey" or "Gran"), ruler of the Adal Sultanate. The stelae at Tiya and other areas in central Ethiopia are similar to those on the route between Djibouti City and Loyada in Djibouti. In the latter area, there are a number of anthropomorphic and phallic stelae, which are associated with graves of rectangular shape flanked by vertical slabs. The Djibouti-Loyada stelae are of uncertain age, and some of them are adorned with a T-shaped symbol. Near the ancient northwestern town of Amud in Somalia, whenever an old site had the prefix Aw in its name (such as the ruins of Aw Bare and Aw Bube), it denoted the final resting place of a local saint. Surveys by A.T. Curle in 1934 on several of these important ruined cities recovered various artefacts, such as pottery and coins, which point to a medieval period of activity at the tail end of the Adal Sultanate's reign. Among these settlements, Aw Barkhadle is surrounded by a number of ancient stelae. Burial sites near Burao likewise feature old stelae. A victory stele of Naram-Sin, a 23rd-century BC Mesopotamian king. The Nestorian Stele (781) records the success of the missionary Alopen in Tang China in Chinese and Syriac. It is borne by a Bixi and forbidden to travel abroad. A rubbing of the Stele of Sulaiman, Prince of Xining (1348), bearing the Mani in six languages: Nepali, Tibetan, Uyghur, 'Phags-pa, Tangut, and Chinese. Tombstones (funerary stelae) at the Common Burying Ground and Island Cemetery, Newport, Rhode Island. Typical inscriptions include the names of the deceased interred under the stones. Ca. 18th century and later. ^ Anglicized plural steles (/ˈstiːliːz/ STEE-leez); Greek plural stelai (/ˈstiːlaɪ/ STEE-ly), from Greek στήλη, stēlē. The Greek plural is written στήλαι, stēlai, but this is only rarely encountered in English. ^ Commons:Category:Battle of Waterloo steles; Timmermans, D. (7 March 2012). "Waterloo Campaign". The British monuments. ^ Dunn, Jimmy. "The Stelae of Ancient Egypt". Tour Egypt. Retrieved 8 July 2014. ^ a b G. Azarpay, Urartian Art and Artifacts, 1968, p32. ^ C. Maranci, Vigilant Powers: Three Churches of Early Medieval Armenia, 2015, p177-182. ^ C. Maranci, Vigilant Powers: Three Churches of Early Medieval Armenia, 2015, footnote 311 on page 198. ^ Caskey, L. D. “An Archaic Greek Grave Stele in Boston.” American Journal of Archaeology 15.3 (1911): 293. CrossRef. Web. ^ Robinson, Edward. “An Archaic Greek Grave Monument.” The Metropolitan Museum of Art Bulletin 8.5 (1913): 94. CrossRef. Web. ^ Campbell, Gordon. The Grove Encyclopedia of Classical Art and Architecture. Oxford ; New York: Oxford University Press, 2007. Print. ^ Grossman, Janet Burnett. Greek Funerary Sculpture : Catalogue of the Collections at the Getty Villa. Los Angeles: JPaul Getty Museum, 2001. Print. ^ Endymion Wilkinson, Chinese History: A Manual (Cambridge, Massachusetts: Harvard-Yenching Institute, 2000): 436. ^ "The Stele of Mount Hua Temple at The West Alp". Vincent's Calligraphy. Retrieved 2017-05-16. ^ a b c Wilkinson (2000): 437. ^ de Groot, Jan Jakob Maria (1892), The Religious System of China, II, Brill Archive, pp. 451–452 . ^ a b Wilkinson (2000): 438. ^ Martin & Grube 2000, p. 113. ^ a b Miller 1999, p. 9. ^ Fuente et al. 1999, p. 187. ^ a b c d e Stuart 1996, p. 149. ^ Sharer & Traxler 2006, p. 235. ^ Stewart 2009, p. 8. ^ Stuart 1996, p. 158. ^ Sharer & Traxler 2006, p. 183. ^ Goudsward, David (5 May 2014). "Ancient Stone Sites of New England and the Debate Over Early European Exploration". McFarland – via Google Books. ^ Menninger, Karl (10 April 2013). "Number Words and Number Symbols: A Cultural History of Numbers". Courier Corporation – via Google Books. ^ Brockman, Norbert (2011). Encyclopedia of Sacred Places, Volume 1. ABC-CLIO. p. 30. ISBN 159884654X. ^ Fukui, Katsuyoshi (1997). Ethiopia in broader perspective: papers of the XIIIth International Conference of Ethiopian Studies Kyoto 12-17 December 1997. Shokado Book Sellers. p. 370. ISBN 4879749761. Retrieved 23 December 2014. ^ a b Lewis, I.M. (1998). Saints and Somalis: Popular Islam in a Clan-based Society. The Red Sea Press. p. 90. ISBN 978-1-56902-103-3. ^ Briggs, Phillip (2012). Somaliland. Bradt Travel Guides. p. 98. ISBN 1-84162-371-7. Miller, Mary (1999). Maya Art and Architecture. London, UK and New York, USA: Thames & Hudson. ISBN 0-500-20327-X. OCLC 41659173. Sharer, Robert J.; Loa P. Traxler (2006). The Ancient Maya (6th ed.). Stanford, California, USA: Stanford University Press. ISBN 0-8047-4817-9. OCLC 57577446. Stewart, Daniel Moroni (2009). "Parentage Statements and Paired Stelae: Signs of Dynastic Succession for the Classic Maya" (PDF). Provo, Utah, USA: Brigham Young University. Retrieved 2016-02-09. Stuart, David (Spring–Autumn 1996). "Kings of Stone: A Consideration of Stelae in Ancient Maya Ritual and Representation". RES: Anthropology and Aesthetics. Cambridge, Massachusetts, USA: President and Fellows of Harvard College acting through the Peabody Museum of Archaeology and Ethnology (29/30 The Pre-Columbian): 148–171. JSTOR 20166947. Wilkinson, Endymion (2000), Chinese History: A Manual (2nd ed. ), Cambridge, Massachusetts: Harvard-Yenching Institute, ISBN 0-674-00249-0.